The Cheechoo-Éléonore Trend project covering 286 km2 is 100% owned. It is adjacent to the northeast to the Sakami project. 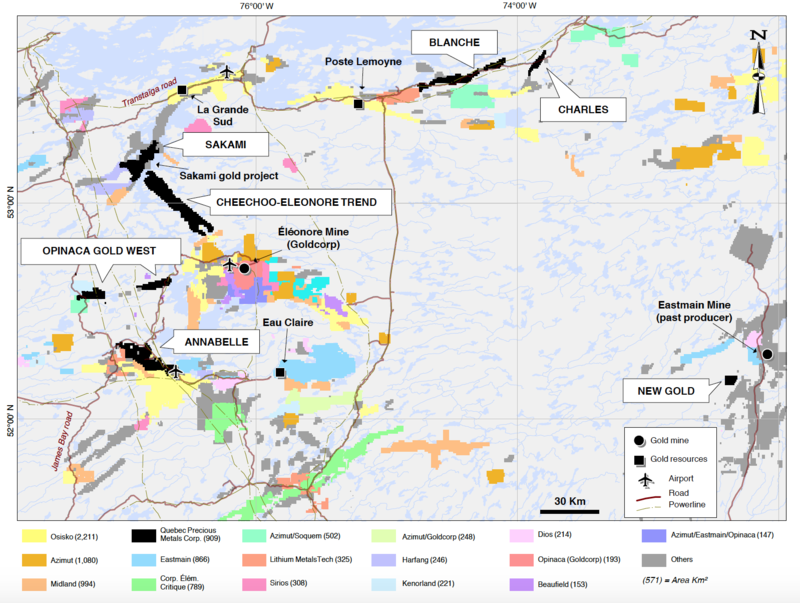 This trend comprises Sirios Resources’ recent Cheechoo gold discovery and the Éléonore mine. The project’s southeastern extremity is situated about 24 km northwest of the Éléonore mine and road access is available within 14 km of this location. On the basis of the same high degree of metamorphism and similar gold-arsenical paragenesis, QPM considers that the geological setting of the project is of a similar character to the Cheechoo discovery and the Éléonore mine. Till sampling programs completed on the project suggest a local source for gold detected in tills from the two priority targets. A follow-up program on these two targets was recently completed. The objective of future exploration programs is to establish the primary source of the gold. The targets and showings that will present the best gold potential will be eventually tested them by drilling.